Lead Fast Indian Pencil month continues with today's review of the Apsara Joi Extra Dark. Made by Hindustan Pencil Co., US fans of this pencil may know it under a different imprint, Nataraj Joi 2B. This is the version of the Joi that CW Pencils carries, and after some testing and an email to the pencil ladies, I can confirm they are the exact same pencil. The Apsara version was available on Amazon, so that's what I purchased, along with a few of the Nataraj from CW to compare. The box I received was marked as produced in May of 2013, so these may or may not be on the market as Apsara still, or could just be under the Nataraj label. This is a fun pencil to look at. There are 5 color ways, and the main color of each pencil covers the barrel and the very end of the cap, and the small stripes on the barrel that come from the main end dip color ride along the hex edge instead of the flat side. Of the 5 different colors, I like the Yellow with Blue accent the best, and Red / Orange after that. These are stamped in a silver foil, which can look weird on the darker lacquers, especially the Purple / Yellow one. The lacquer seems thin and was chipped in a few spots, but the application is smooth. They feel light in the hand due to having no eraser and are comfortably hexed. Well-centered cores are held in place by treated Linden. It sharpens easily. There was a little bit of slat separation on a couple of the Apsara ones, but it was minimal and more than likely due to age. The core is dark. On the Apsara version, it just says "Extra Dark", but on the Nataraj version, it says 2B. The line is true to the 2B grade. The core is smooth and reminds me of the Blackwing Extra Firm core in the 24 and 530. Point retention is not the best with my heavy hand, but lighter-handed writers could get good durability out of this pencil. I was surprised to find that it did a decent job on toothy paper and I found that it held it's point better than the Viking 029 Skoleblyanten in the Baron Fig Infinity. I'm beginning to believe grade means nothing from brand to brand, as the 029 is listed as HB from Viking, but the Joi is listed as 2B, and they are quite similar in line, besides the point retention. Yet another reason to test ALL the pencils! Joi logo on both pencils. 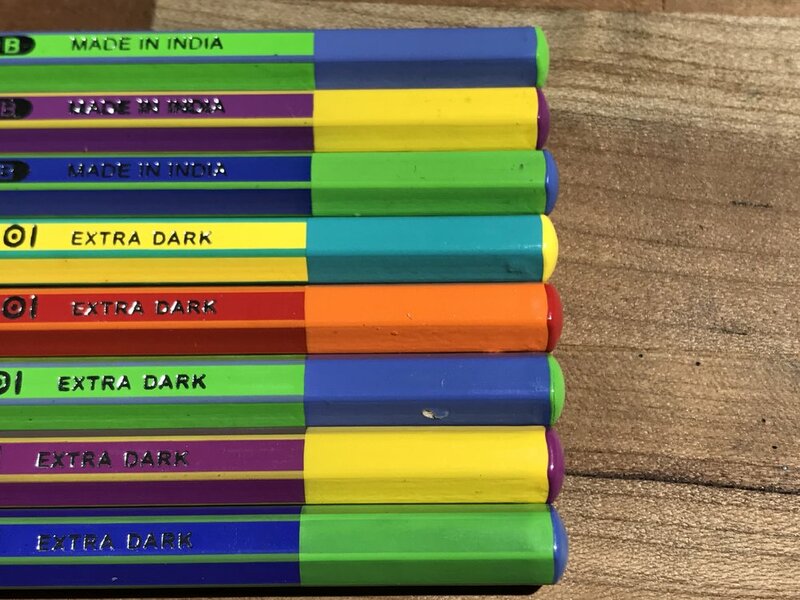 Like so many of the Indian pencils I've been reviewing this month, these are a dark core with a cool wrapper. There is nothing super special about the Joi besides a cool paint job. They're well-made, the core is wonderful, but besides the paint job, nothing truly sets this one apart. It's a great option if you're trying to color-coordinate your stationery supplies for the day, if you do that sort of thing. I'm happy to have them and will pick one out of the pencil cup from time to time, but I don't see myself making this a daily carry. I would recommend this pencil if you're looking for a dark core in some cool color ways. Available on Amazon, 10 with a sharpener and eraser for $4.95. Singles of Nataraj Joi available at CW Pencils.